Those other guys? They’re just biting on your style, and they’ll never be your equal. As the great comedian/fan-of-you so rightly proclaimed “Mr. Pibb is a poor imitation of Dr. Pepper. Dude didn’t even get his degree.” And in this current economic climate? Higher education is becoming an even greater asset in continued career success. You’re not going anywhere, friend. Although I know we’ve had our ups and downs, like that time I experimented with heating you up and mixing you with lemon juice, I just want to let you know that I will always be there. Maybe sometimes I’ll be drinking Coke, and other times I’ll be drinking Root Beer, but there are always going to be times when I want something bolder. There will always be times when I demand all 23 of your flavors batting against my tastebuds. That’s never going to change, Dr. P.
This entry was posted in Soda and tagged Dr. Pepper. Bookmark the permalink. Also good: Cherry Dr. Pepper. Much better then Diet Cherry Vanilla Adjective-Overload Dr. Pepper. Oh god, I have a confession to make. 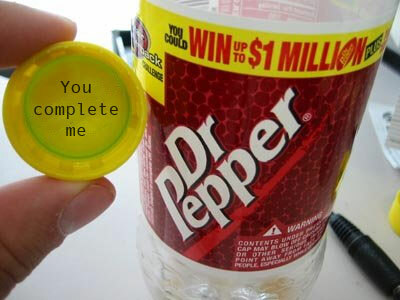 This letter to Dr. Pepper? It was actually drafted while sipping on a tall glass of Cherry Dr. Pepper. Oh god, I’m such a fraud. I hope the real Dr. Pepper doesn’t read this blog.